Figure 10. Relief Valve Plug Assembly. Figure 11. Driveshaft, Drive Gear and Retaining Ball Assembly. Insert valve spring (Figure 10, Item 4) inside of relief valve (Figure 10, Item 2). Insert pin (Figure 10, Item 3) in valve spring (Figure 10, Item 4). Install a new copper gasket (Figure 10, Item 5) on relief valve plug (Figure 10, Item 6). 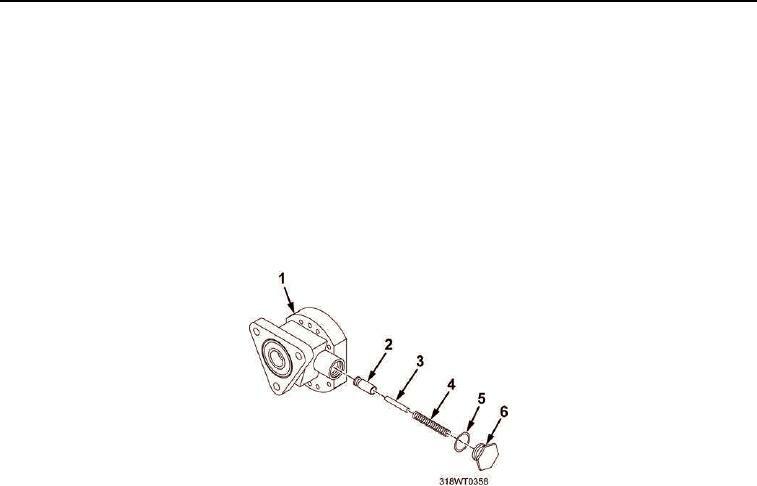 Install relief valve plug (Figure 10, Item 6) in fuel pump body (Figure 10, Item 1). Assemble driveshaft (Figure 11, Item 1), drive gear (Figure 11, Item 2) and retaining ball (Figure 11, Item 3). Position drive gear (Figure 11, Item 2) on a press. gear retaining ball (Figure 11, Item 3) detent. Place gear retaining ball (Figure 11, Item 3) in detent.